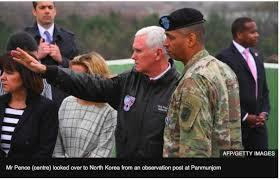 Pence: US era of strategic patience with North Korea over – Royal Times of Nigeria. US Vice-President Mike Pence has said his country’s “era of strategic patience” with North Korea is over. 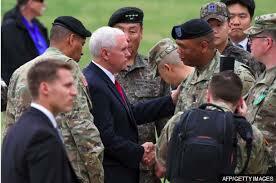 Mr Pence made the remarks at the demilitarized zone, the area dividing the two Koreas, during a visit to South Korea to reaffirm ties. He arrived in Seoul on Sunday hours after North Korea carried out a failed missile launch. Today, the US and South Korea launched a joint air force military exercise to ensure readiness against North Korea, according to South Korean media. Mr Pence also reiterated the US commitment to South Korea, saying it is an “iron-clad alliance”, and that North Korea “should not mistake the resolve” of the US to stand with its allies. He has denounced North Korea’s latest ballistic missile test as a “provocation”.